Finally waking up to the scale of the humanitarian crisis resulting from the gruesome mass sack of Otodo-gbame waterfront community, the Lagos State Government has constituted an adhoc committee to offer relief assistance to the displaced populations affected by the demolitions in 2016 and 2017. At a meeting with the Lagos state commissioners for Special Duties and Home Affairs, the Lagos State Government announced its intention to provide assistance to the displaced, yielding to the mounting pressure by the civil society and advocacy groups. SPACES FOR CHANGE’s director (Victoria Ohaeri) and advocacy officer (Aizighode Obinyan), Otodo-gbame community leaders, Honorable Solomon Hennu, and the Olori Ebi, Wayidi Poroh, and other concerned groups were present at the first meeting of the adhoc committee co-chaired by Honorable Seun Oladejoh, the Commissioner for Special Duties and Honorable Lateef Abdulrakeem, the Commissioner for Home Affairs.This meeting was held on April 18, 2017 at the Lagos State Ministry of Special Duties in Ikeja Lagos. 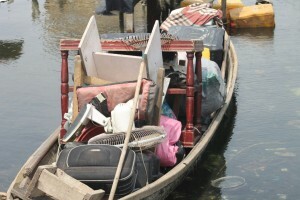 SPACES FOR CHANGE welcomed the state government’s plans to provide relief materials and the most basic assistance to the displaced, but however, urged state authorities to take steps to ensure Lagos citizens enjoy legal protection against recurrent forced evictions so that they can live a dignified life. Providing relief assistance, though commendable, is only a temporary measure that neither protects the displaced from future evictions, nor addresses the multifaceted issues that trigger the land disputes, demolition attacks and communal clashes in the area. In this regard, SPACES FOR CHANGE advocated that urban policy reviews were necessary, in accord with the country’s human rights obligations and global best practices. State representatives vehemently resisted this idea, including the proposal to use the committee as a platform to push for change(s) in the city’s urban governance processes. ‘Our mandate is simply to offer relief assistance to verifiable community members affected by the demolitions’, the two commissioners emphasized. The commissioners disclosed that the pending lawsuits against the state authorities were the main reason for not considering the political solutions suggested. ‘The committee will only work to provide interim assistance or palliatives to ameliorate the hardship the displaced families are facing, and get the people off the streets’, Commissioner Abdulrakeem reiterated. Despite repeated inquiries, the committee refused to specify what the terms ‘relief assistance’ or ‘interim measures’ comprised of. After a long debate and deliberation on the above issues, it was agreed that Otodo-gbame community leaders should submit a list of the displaced Otodo-gbame residents. This list shall contain the names of displaced persons, the details of the properties they lost, and any other formal registration instruments that they have. The state authorities plan to verify this list before they can commence the relief support efforts. After the meeting, S4C embarked on a guided tour of different localities across the State to trace the displaced Otodo-gbame residents to the areas they moved to. This enabled us to understand their coping mechanisms and document their individual and collective experiences after the April 2017 forced evictions. With the information gathered from this exercise, S4C have held several meetings with the displaced community members to facilitate the collation of data of members now squatting within the several localities across the State. This task, though arduous, is still ongoing. You would recall that Otodo-gbame is one of the fishing communities situate along Lagos creeks and coastlines in the upscale Lekki area of Lagos where land prices are prohibitive, and far beyond the reach of average income earners. As was the case of Maroko in July 1990, Otodo-gbame residents dwell on prime land, coveted by property developers and powerful private actors, who have strong connections and access to the corridors of power. Consequently, the residents have since 2014, endured incessant attacks from persons determined to take over their land. The lead actors in the land-grabbing campaign are the Elegushi Family and the Lagos State government through its ministries, namely: the Ministries of Environment, Physical Planning, and Waterfront Development respectively, and the Kick-Against-Discipline Task Force (KAI).